Donation after Circulatory Death (DCD), previously referred to as donation after cardiac death or non-heartbeating organ donation, refers to the retrieval of organs for the purpose of transplantation from patients whose death is diagnosed and confirmed using cardio-respiratory criteria. World-wide, there is considerable variation in the contributions that DCD makes to deceased donation overall. While some countries have no DCD programmes whatsoever, in others such as the UK, Netherlands and Australia the contributions are significant. Furthermore, whilst some countries focus principally on controlled DCD (e.g UK, Australia) or uncontrolled DCD (e.g. France, Spain), other countries such as the Netherlands support both forms of DCD. Figure 1. 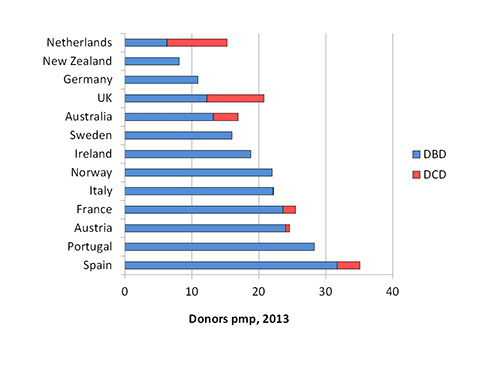 Relative contributions of donation after brain death (DBD) and donation after circulatory death (DCD) to deceased donation in various countries around the world, as measured by donors per million population (pmp) in 2013. Data courtesy of Transplant Procurement Management at www.tpm.org. DCD donation has increased substantially over the last decade, from 288 donors in 2008-2009 to 619 in 2017-2018, representing 39% of all deceased organ donors in this year. Figure 2. Number of DCD donors in the UK, 2000/01 – 2017/18. The success of the UK DCD programme can be attributed to the resolution of the apparent legal, ethical and professional obstacles to this model of donation. The underpinning principle of the programme is that donation can on many occasions be legitimately be viewed as part of the care that a person might wish to receive at the end of their lives. In the UK, an average of 2.8 transplantable organs are retrieved from DCD donors, compared to 3.7 from DBD donors. The biggest contribution of DCD is to kidney transplantation, with 39% of all deceased donor kidney transplants coming from this source in 2017-2018. The lower donation potential of DCD donors is in large part a result of the ischaemic injury suffered by solid organs in the time interval between treatment withdrawal and cold perfusion, with the liver and pancreas being particularly vulnerable. For kidney grafts this is reflected in a higher incidence of delayed graft function (requiring a short period of post-implantation renal support), although long term outcomes are similar to DBD grafts. However, the consequences of excessive ischaemic injury to the liver are rather more serious, with a higher incidence of graft failure, post-operative morbidity and ischaemic cholangiopathy. In contrast, DCD donors may be the preferred source of transplantable lungs because the organs have not been exposed to the sympathetic storm suffered by potential DBD donors. Future developments in controlled DCD are likely to centre around efforts to reduce ischaemic injury and increase the number of lung retrievals from DCD donors, possibly to include heart retrieval. Although some of this is dependent upon post mortem interventions such as regional normothermic recirculation and ex vivo reperfusion, a closer adherence to the standards for the confirmation and diagnosis of death as defined by the Academy of the Medical Royal College report and described in the Consensus statement on DCD from the Intensive Care Society and British Transplantation Society will also make an important contribution by limiting the initial warm ischaemic injury. For further details on the contribution of DCD to transplantation in the UK go to NHS Blood and Transplants latest Transplant Activity report. Although a number of transplant units have in the past supported uncontrolled DCD organ retrieval from nearby Emergency Departments, these programmes are currently inactive.